A number of scientific agencies and organizations discover and track near-Earth objects. But how best to generate early warnings of a potential impact? 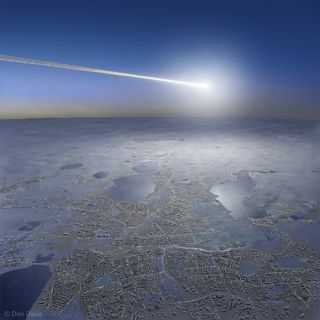 Shown is an artist’s view of the super bolide that exploded over Chelyabinsk, Russia in February 2013. The danger of an asteroid smacking into Earth is a clear and present hazard, underscored by the huge fireball and shattering explosion that occurred over Chelyabinsk, Russia, in February 2013. That event served as a global wake-up call — for both politicians and the public — that Earth is not impervious to "out of the blue" asteroid strikes. But how should researchers pool together the expertise of the world's many existing scientific agencies to not only discover and track objects but also to generate early warnings of a potential impact? Workshop on communicating about asteroid impact warnings and mitigation planning brought together an international and diverse set of experts. A workshop hosted by the Secure World Foundation in September brought experts together to discuss the IAWN, which operates independently of the United Nations. The workshop report has just been released as a public document. The results of the workshop, however, have not yet been reviewed by the IAWN Steering Committee, nor endorsed or adopted for implementation. "We made very good progress toward identifying the main issues involved with communicating with the media and public regarding warnings of possible NEO impacts and other related issues," said workshop participant Sergio Camacho, who chairs the U.N. Action Team on NEOs — a group that was established in 2001. The recent workshop brought together a diverse group of experts from the near-Earth asteroid science, risk communication, policy and emergency management communities. Recommendation 1: IAWN should establish a five-year plan with near- and midterm actions for becoming the global trusted and credible NEO information, notification and warning network. This plan should consider the fundamental principles of risk communication. Recommendation 2: IAWN should employ a full-time communications officer to oversee the development and execution of its five-year plan. Recommendation 3: IAWN should sponsor briefings and workshops for reporters to improve NEO education within the mass media community. Recommendation 4: IAWN should develop and employ a new, nonprobabilistic scale for characterizing asteroid impact hazards and impact effects. The Broomfield Hazard Scale is proposed for IAWN's consideration as an impact-effects scale. Recommendation 5: IAWN should create a website as soon as possible. An IAWN member organization should register the website immediately. Recommendation 6: IAWN should employ a full-time webmaster to create and maintain its website. Workshop participants agreed that the task ahead of honing NEO-speak communiqués for the public and politicians will not be a simple task. "Communicating about any future asteroid threat will not be easy," said Michael Simpson, SWF's Executive Director. "People will need messages they can act on," he told Space.com, "and they will deserve to know the limitations on what modern science can predict." Lindley Johnson, program executive for NASA’s Near-Earth Object (NEO) Observations Program, discusses bolide impacts on Earth’s atmosphere. The report captures the complexity of the challenge when it comes to communicating asteroid impact risks, said Laura Delgado López, SWF Project Manager and co-lead of the workshop. "It is not just about crafting the right message, but also about understanding the different audiences, how they respond to information and how this impacts decision making," López told Space.com. Linda Billings, National Institute of Aerospace consultant to NASA's Near-Earth Object Program, was also a workshop co-lead. There is an easily understandable danger associated with an asteroid impact to Earth — a danger that needs no explanation because we all perceive it at the most basic, primal level, said workshop participant José Luis Galache, a staff astronomer and a strategy and innovation planner at the Minor Planet Center (MPC) in Cambridge, Massachusetts. The MPC operates at the Smithsonian Astrophysical Observatory, under the auspices of the International Astronomical Union. It is the official body that, among its duties, keeps track of NEOs that live in the Earth's neighborhood and might one day pose a threat to our planet. The “Broomfield Hazard Scale” has been proposed for consideration as a way to characterize and communicate asteroid impact hazards and effects. Galache told Space.com that one NEO communications issue lies in quantifying and qualifying the effects of an asteroid impact, given how we perceive danger as mostly "all or nothing." Light show, sonic boom, shock wave, or … ? "Earth is hit daily by dust, pebbles, and rocks ... mostly leftovers from the formation of the solar system, which are stopped by the protective envelope of our planet's atmosphere. Occasionally an object (an asteroid) will survive its passage through the atmosphere and impact on land or water, or maybe disintegrate in the air, but with enough explosive force that the shock wave is felt on the ground," Galache said. How much damage can such an object cause? "That depends on its size, composition, structural integrity, speed, angle of entry and point of impact or explosion," Galache said. "If these quantities can be known ahead of time, if only approximately, the only challenge left is to notify the population who might be affected of what they can expect … a light show, a sonic boom, a shock wave, or maybe something worse," he said. It is of paramount importance that this communication take place as early as possible and through channels that will reach as many people as possible, Galache said. "There is no point to discovering an impending danger from an asteroid if it's not then possible to warn those who will be affected by it," Galache said. "Effective communication of the NEO hazard or imminent threat by a particular asteroid is paramount and just as important as NEO discovery." Leonard David has been reporting on the space industry for more than five decades. He is former director of research for the National Commission on Space and is co-author of Buzz Aldrin's 2013 book, "Mission to Mars – My Vision for Space Exploration," published by National Geographic. Follow us @Spacedotcom, Facebook and Google+. Original article on Space.com.